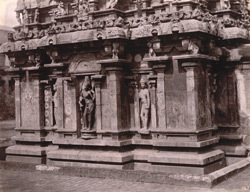 Photograph of sculptures on the wall of the shrine of the Nageshwara temple at Kumbakonam, taken by Alexander Rea around 1892, from the Archaeological Survey of India Collections. Kumbakonam, in Tamil Nadu, was an important centre during the 9th to 13th centuries under the Chola dynasty. There are fifteen temples in the town dedicated both to Shiva and Vishnu. The Nageshwara Temple was erected in AD 886 during the Chola period, with later additions. The temple is situated in a courtyard entered through gopuras, or pyramidal towers, covered in sculptures, typical of the late Chola style. The outer walls of the sanctuary have sculptured panels which are among the finest of the Chola period. The central niche on the rear or west wall of the shrine contains a figure of Shiva Ardhanarisvara, or Shiva as Half Woman. The figure on the right in this photograph is a figure of a prince.